Interested in hosting your event at our Eden Prairie Campus? Grace Church provides you with three essentials for a successful business or personal event: an unsurpassed facility, a convenient location, and a professional staff committed to becoming a strategic partner in your about. Grace Church looks forward to assisting you with your next gathering. Whether your event is large or small, whether it is a banquet, reception, business meeting, social function, special occasion, or a ministry meeting, we are here to help. Remember, regardless of its size or type, a successful event begins with early planning. We would love to schedule a tour for you to see our facilities and meet our professional staff. You will have the opportunity to see our space, view pictures of prior catering events, and design a menu. Let us help you create a special gathering. Our culinary staff would be happy to customize a menu that fits your unique taste or budget. 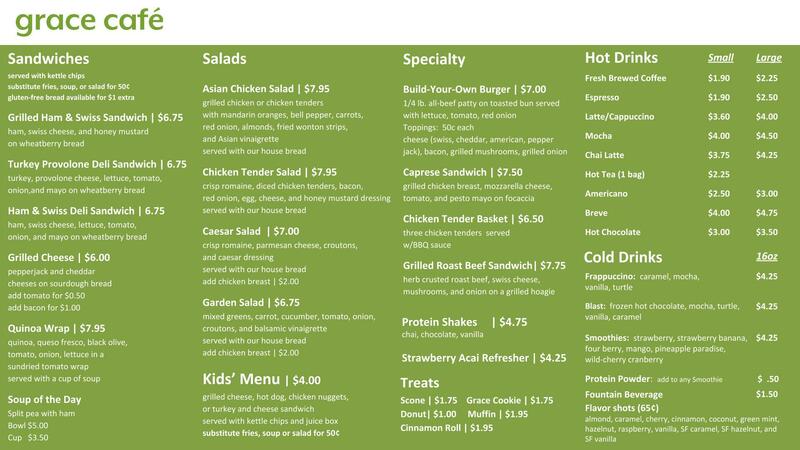 Contact us with your custom menu requests. Download general information outlining stipulations concerning the provision of food and beverage service at Grace Church. "The facility, staff, and volunteers of Grace Church are second to none. The service and hospitality our teams received was exceptional." "The Eden Prairie Chamber of Commerce utilizes Grace Church for many of its programs. From our spring trade show to business luncheons and even our Board retreat, Grace Church's facilities can accommodate them all. Their staff is very helpful, and the food always gets compliments!" "I am personally responsible for five Educator Conventions in my Mid-America Region. I can tell you the convention facilities at Grace Church were second to none! More importantly, the hospitality staff was both professional and personable. This makes the hard work of running a convention so much more enjoyable. I can't wait to return to Grace Church next year for our convention!" "The staff at Grace Church is a pleasure to work with, and it has been great for World Help to partner with them. It has been a first-class experience when I have spoken at their wonderful facility." Your wedding day dream is now in motion, filled with excitement, anticipation, and expectations. Our Hospitality Coordinator is ready to help make your day special by creating a memorable wedding reception for you and your guest. Our professional culinary staff has carefully prepared savory menu items sure to suit your tastes, needs, and budget. All this is to make your wedding day dream come true. View our menu selections and photos of food and events in our Banquet Menu. The Refuge, also known as the "Grace Church Retreat Center," is an amazing 285-acre property located in Stockholm, WI. This facility is used primarily by Grace and its partner ministries to host transformational ministry events of all kinds, especially those with a youth focus. We look forward to seeing how the Lord will continue to use this amazing facility to be a place where broken hearts are mended, the next generation equipped, and leaders are refreshed. For more information on its mission and history, visit our website. Check Us Out – Visit our website and Facebook page. Serve at Retreats – Several Grace Church ministries have retreats here throughout the year. Contact your ministry leader for more information. Join the Team – We are always looking for people to help the ministry, especially with skills in administration, construction, cooking, landscaping, gardening, and hospitality. If you want to be a part of what’s going on, send an e-mail to Jonathan Engbrecht. Referrals – If you or someone you know has a ministry or idea that would use The Refuge, especially with a 0-18 or outreach focus, please contact Jonathan Engbrecht.